What is Reflexology? How does Reflexology Work? What is Ear Reflexology? What are the Benefits of Reflexology? How does the Reflexology session work? Reflexocurist(Reflexologist) seeks to discover imbalances in the energy of the body. No matter what type of reflexology is practiced the same core belief is “how the body is helped to heal” Always keep in mind that reflexology is not intended, and should not be used as a substitute for conventional medicine. Reflexocurist believe that a balanced immune system prevents illness, and that the body’s systems function optimally when the body is in a relaxed state. Reflexology is a timeless art of self healing. It offers stimulating energy to every organ and system in the body; replenishes balance and energy to entire body. Reflexology is a holistic therapy that focuses on the areas in the feet, hands, and ears which correspond to all of the glands, organs and parts of the body. Stimulating these reflexes properly can help many health problems in a natural way, a type of preventative maintenance. 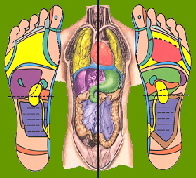 Reflexology is a serious advance in the health field and should not be confused with massage. 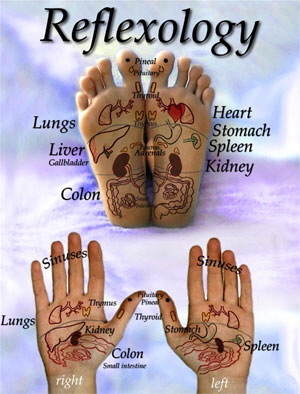 Reflexology is safe, preventative, gentle, and noninvasive: many patients find that it does enhance overall health. All reflexocurist, no matter what type of reflexology they practice—share the same core belief about how reflexology helps the body heal. They believe that the body becomes imbalanced when it is under stress or fighting illness. These imbalances can cause the body to become sicker and unable to combat stress. When reflexocurist use their hands to twist, rotate, wring, stretch, or press certain points on a patient’s feet, they prepare the corresponding body parts to heal. Ear Reflexology is a diagnostic and healing treatment that stimulates points on the ear that correspond to different parts of the body. 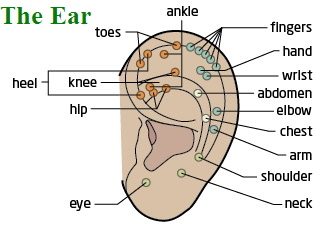 Ear reflexology is based on zones and points in the ear which relate to the meridians and other parts of the body. Every person’s ear is unique; the ears are like the fingerprints and can be read to reveal our inner nature. The history of ear reflexology can be traced back to Chinese and Egyptian medical work of about 3000 to 4000 years ago. Ear Reflexology can benefit you in many ways, but the most notable is for the instant relief of pain. It can also be used for clearing infections, lowering blood pressure and balancing hormones.